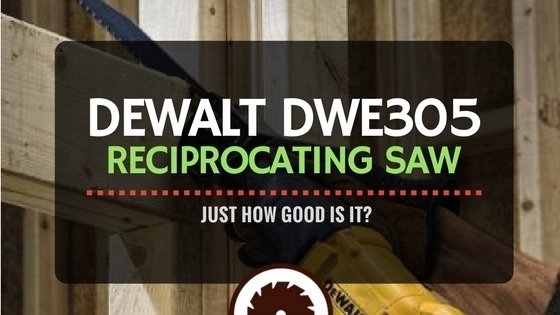 DeWalt DWE305 Reciprocating Saw | Just How Good Is It? » DeWalt DWE305 Reciprocating Saw | Just How Good Is It? The DeWalt DWE305 is one of the best reciprocating saws sold in stores out there. As advertised, this saw is designed to handle a wide range of construction, demolition, plumbing, and do-it-yourself tasks like cutting wood, masonry, PVC pipes, tree branches, and many other similar tasks. 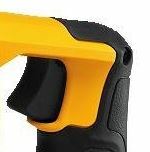 However, does the DeWalt DWE305 reciprocating saw work as advertised? In this post, we have scrutinized the saw’s features, ratings from reliable reciprocating saw reviews, benefits, and downsides to help you gauge if it is worth purchasing. To add to the bargain, we have recommended other excellent reciprocating saws that you would consider as alternatives to DeWalt sawzall. The DeWALT DWE305's motor is one of the primary features that make it a popular choice for most people. The powerful engine generates a maximum cutting speed of 2900 strokes per minute, a rate that is sufficient to manage light to heavy tasks like cutting masonry, metals, plastics, fiberglass, lumber, tree branches, and many other objects commonly used in the construction industry and in homes. As such, we would say that this corded reciprocating saw is an all in one tool for construction, demolition, remodeling, plumbing, and any other do-it-yourself project. The DeWALT DWE305 comes equipped with a variable speed trigger that lets you adjust your saw’s cutting power according to the difficulty of the task at hand. For instance, a higher cutting speed would be ideal for cutting metals or masonry, while a lower rate provides sufficient cutting power for light tasks like cutting cardboards and thin tree branches. If you want to increase your saw's cutting speed, you press the trigger, and if you want to reduce the cutting speed, you release it slightly. Nonetheless, the saw’s user manual warns against using your saw at low speed as it could damage the saw. 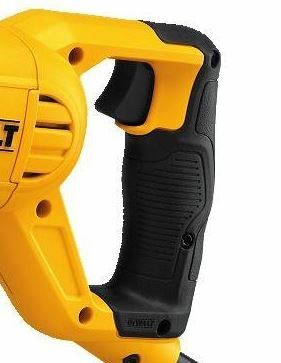 The DeWALT sawzall reviews indicate that the saw has a rubberized comfort grip that absorbs excessive vibrations that could fatigue or hurt your hand. Moreover, the rubberized handle provides a comfortable and firm grip that guarantees safety and productivity. Therefore, the ergonomic grip eliminates unnecessary discomfort to let you work for long hours. Another reason why you would want to purchase this reciprocating saw is the generous three-year warranty that backs its performance. This generous manufacturer warranty protects you against the repair costs associated with manufacturing blemishes. During this period, DeWALT will repair your saw at no charge. This warranty, however, does not cover the repairs resulting from normal wear and tear, improper use, or negligence. In addition to the three-year manufacturer warranty, the DeWALT DWE305 also comes with a three-month return policy. Therefore, you can return the reciprocating saw for a refund in case it fails to uphold its marketing promise. The DeWALT DWE305 reciprocating saw’s 1- 1/8 long stroke power offers aggressive and fast cuts for heavy tasks cutting tasks like cutting masonry and thick lumber. This feature saves the time and effort that you would have spent making repeated passes to get the job done. Another useful feature of this reciprocating saw is the keyless lever-action clamp that lets you change blades effortlessly. The straightforward blade installation process entails pulling the clamp's release lever up and inserting the blade's shank into the clamp. With the blade’s shank in, you release the lever. The blade clamp supports four blade positions. What Sets This Reciprocating Saw from the Rest? One of the primary features that make this reciprocating saw unique from its competitors is the one-year free service guarantee. During the one year, the manufacturer repairs or replaces your saw’s broken parts at no cost. Other features that make this saw unique include the intelligently designed blade clamp that supports four blade positions for enhanced versatility and the lever action blade clamp that offers quick blade change. With a powerful 12-amp motor that generates up to 2900 strokes per minute and a 1– 1/8 stroke length, we would say that the DeWALT DWE305 is one of the best performing reciprocating saw that you would find in stores out there. In regards to forgiveness, we would say that the DeWALT DWE305 is a beginner-friendly reciprocating saw since its keyless lever-action blade clamp facilitates easy blade change, it comes fully assembled, and its use is not complicated. If you want to use the saw, you just install a blade into the blade clamp, plug the saw’s cord into the mains, and then pull the trigger to start sawing. The DeWALT DWE305 is built from an all metallic body that is sturdy enough to serve you for an extended period. Besides having a frame that lasts for long, its components are also made to withstand the damage resulting from heavy duty sawing for an extended time. However, some DeWALT 12-amp reciprocating saw reviews report that parts of the saw can fail after a few uses. 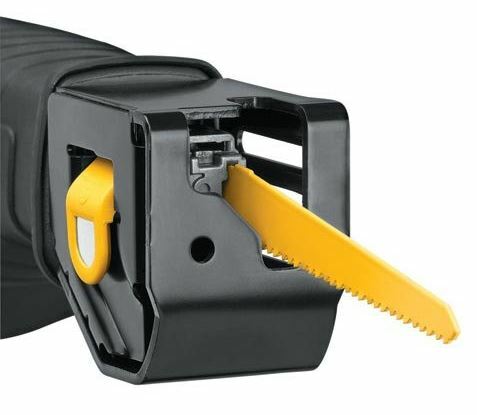 Aesthetically, this reciprocating saw features an attractive color combination of yellow and black colors that give the saw a unique, stylish, and professional appearance. Its handle is ergonomically designed to provide you with the comfort you need to complete long working sessions. In regards to value, we would say that that this reciprocating saw offers reasonable value for money. However, you can still find an excellent reciprocating saw with similar or better features if you spare some time to shop around. The Makita JR3050 comes in an assortment pack containing the reciprocal saw, six pieces of blades, and a plastic case to store and carry your saw. On that account, this saw might be an ideal investment for beginners who lack the knowledge to purchase appropriate blades separately. The Makita JR3050 reciprocating saw utilizes an 11-amp motor that provides sufficient power to handle light to heavy tasks. Actually, this reciprocating saw can be as reliable as the DeWalt DWE305 reciprocating saw. Similar to the DeWALT DWE305, this reciprocating saw offers a 1- 1/8 inch long stroke that provides aggressive and fast cuts to handle heavy-duty sawing tasks effortlessly. Its variable speed trigger lets you regulate the saw's speed accordingly. Just like the DeWALT DWE305, the Milwaukee 6519- 31 uses a 12-amp reciprocating saw uses a 12-amp motor that is versatile enough for demanding tasks like cutting masonry, metal, and any other tough objects. Its 1- 1/8 inch stroke enhances the saw's performance. 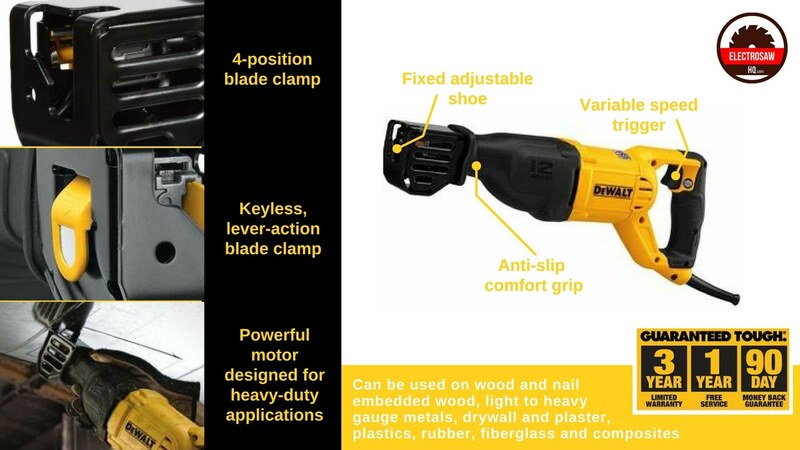 Other features that make the Milwaukee 6519- 31 an excellent competitor to the DeWALT DWE305 is its ergonomically designed handle that keeps you comfortable throughout your working session and the QUIK-LOK blade clamp for natural blade changes. The Milwaukee 6519- 31's counterweighted mechanism shields your hand from vibrations that could hurt your hands. Its variable speed trigger lets you regulate the saw's cutting speed to match the task at hand. The two features make the reciprocating saw one of the most efficient saws on the market. The Hitachi CR13VBY reciprocating saw features the User Vibration Protection technology, an innovative feature that reduces the vibrations produced by a standard reciprocating saw by up to 65 percent. For this reason, this model would be an ideal investment for those who find it hard to withstand a reciprocating saw’s vibrations. Like the DeWALT DWE305, this saw has a 12-amp motor that is powerful enough to handle light to heavy tasks, a variable speed dial that gives you more cutting control, and an ergonomic handle that keeps you comfortable. Like the DeWALT DWE305 that is backed by a 3-year warranty, the Hitachi CR13VBY has a five-year warranty. If you are looking for an affordable and lightweight reciprocating saw besides the DeWALT DWE305 for your small to medium size projects, then the SKIL 9206-02 reciprocating saws might be the right alternative. 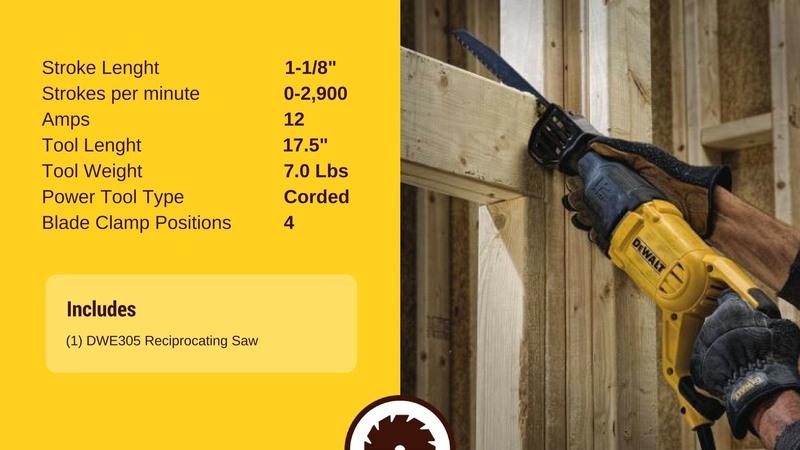 Unlike what is evident in the DeWalt reciprocating saw reviews, this review reveals that the SKIL 9206-02 uses a 7.5-amp motor, a suitable option for small to medium size projects. Despite its affordable price and low amp rating, this reciprocating saw has several features that make it an excellent alternative to the DeWALT DWE305. For instance, it features some of the heavy-duty construction models that can last for a long time, a tool-less blade change system for simple blade changing, and an ergonomic handle.